It cures what ails ya! Apparently. You know Snake Oil? I reviewed it a while back (along with Cards Against Humanity). I said it was really good. Well, Snake Oil: Party Potion is the same game. If you like Snake Oil, you'll like Party Potion too. What? You want something more? Okay, okay. Here's the deal. 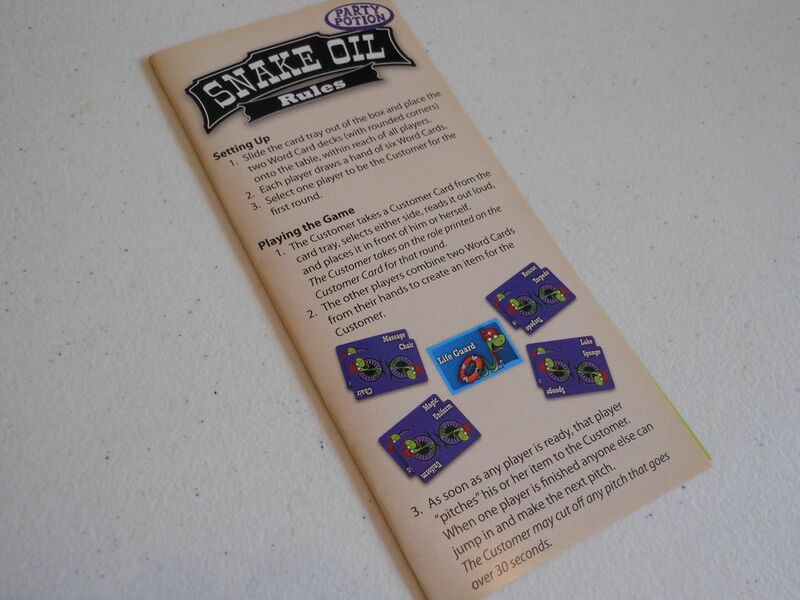 If you've never played Snake Oil, you need to. It's not one of those "meat and potato" games like Super Dungeon Explore or Battles of Westeros, but it is a perfect example of how to do a party game right. Regular visitors to my blog may have heard me complaining about party games. I find them pretty awful. Not as bad as trivia games, but pretty bad. 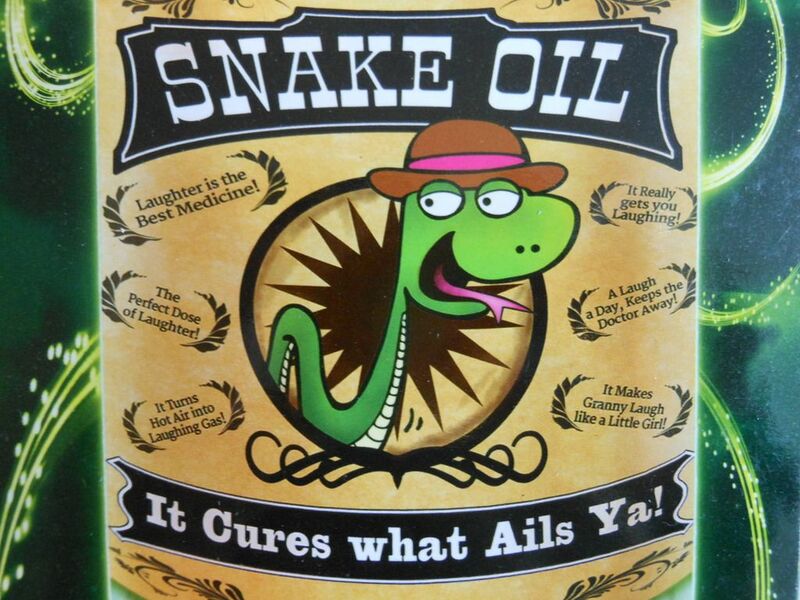 Snake Oil is one of the brilliant exceptions, and is one of the very best things to do with a group of people while keeping your clothes on. It works for gamers and non-gamers, children and adults. And you can explain the rules in the time it takes you to shuffle the cards. The basic concept is simple. One player draws a card that specifies a type of customer. It could be something relatively normal, like a life guard or a business person, or it could be something more unusual, like a snowman. Every other player has a hand of cards, each of which has a single word on it. Taking it in turns, the players put together two words to "invent" a product, and then they have 30 seconds to pitch it to the customer. And this is the brilliance of the game: players get to be as imaginative and crazy as they want. How do you sell a Pimple Bazooka? What is a Chalk Dog? Does anybody really need a Sack Puddle? The game encourages creativity, and it allows you to adjust your answers to accommodate any group of players. Unlike something like Cards Against Humanity, where you are railroaded into a certain style of humour, with Snake Oil, you get the choice. And choice is a powerful thing. After everybody has pitched a product, the customer chooses a "winner," gives that person the customer card, and a new round begins with a new customer. Once everybody has been the customer once, the person who claimed the most customer cards wins. This really isn't a game about winning. If you like getting together with friends, laughing, joking, creating stories, and not really giving a damned who wins, then you need a copy of Snake Oil in your life. And that means you probably need a a copy of Snake Oil: Party Potion too. You see, Party Potion is just more of the same. 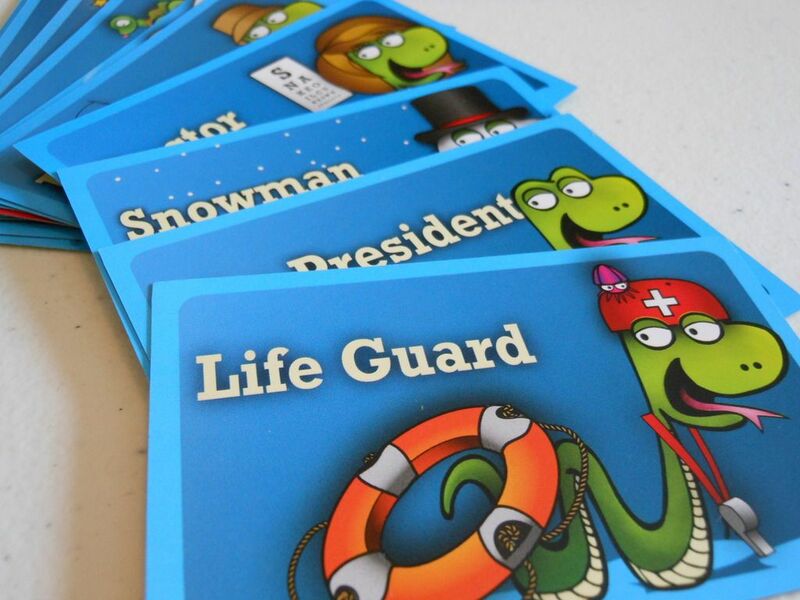 You get a wedge of new customers, and a massive wedge of new word cards. There are actually enough cards for Party Potion to work as a standalone, portable version of the original game, but it works best as an expansion. When you shuffle the new cards in with your old cards, it completely reinvigorates the game, especially if you were getting to the stage where you were seeing the same card combinations turning up frequently. However, it is not without its issues. Let's say, odd design choices. First of all, the minimum age limit for the original Snake Oil was 10, but for Party Potion they have reduced the age to 8. I haven't really noticed any difference in the kinds of words used in the two sets, but I assume that catering for a slightly younger market might have led them to omit words that are a bit risky. For example, in the original game, there is a Corpse word card, and one of the customers is an Executioner. Of course, at the end of the day, players are combining the cards however they want, and selling their crazy contraptions however they want, so no matter how tame the words on the cards may seem, the potential for vulgarity and darkness is every-present. 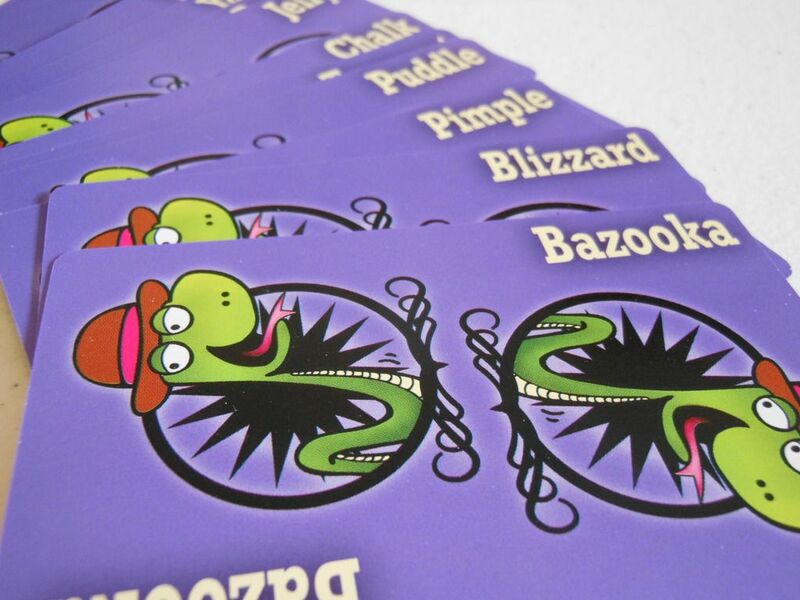 The second odd design choice is more obvious, and more jarring: The backs of the word cards in Party Potion are a different colour to those found in Snake Oil. While it doesn't ruin the game to know if you are drawing cards from the base game or the expansion, it is still a very silly idea, and really the only bad thing I have to say about an otherwise really rather lovely title. 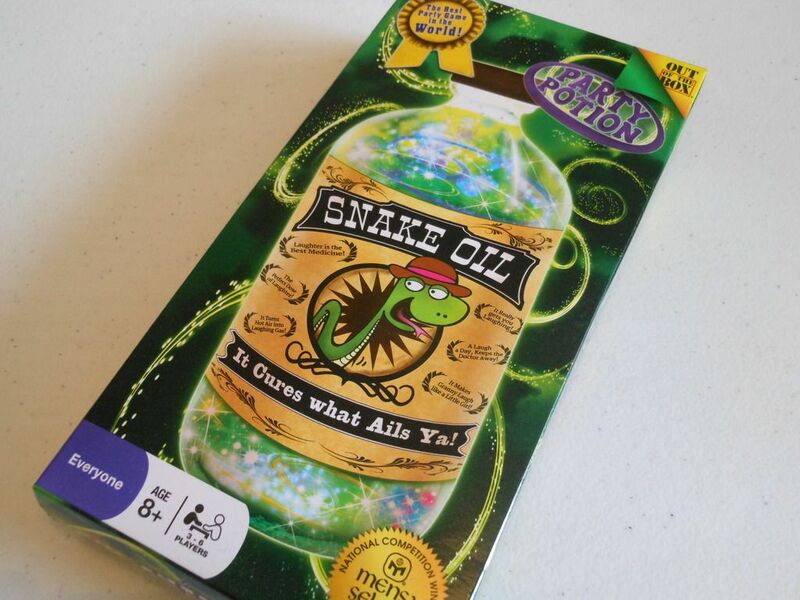 If you don't have Snake Oil in your game collection, Party Potion is a decent taster at a slightly lower price point, so you can see whether the game goes down well with your motley crew before investing more heavily. If you already have Snake Oil... Well... Party Potion is a no-brainer. Right?